This past weekend, my car miraculously got me down to Burlington, VT, where I hopped a flight to DC. Final destination was a wedding in Baltimore. Reunited 10 years after we’d first met for our undergrad in Baltimore, many of my friends remarked on how stupid we were to stay in our little campus bubble and not spend more time exploring the city. 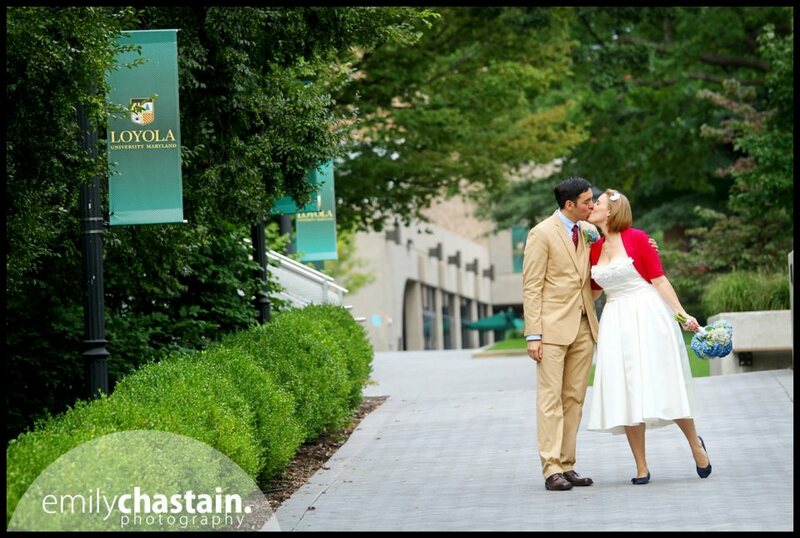 When you see Loyola University Maryland's campus, you can understand why we rarely ventured out. 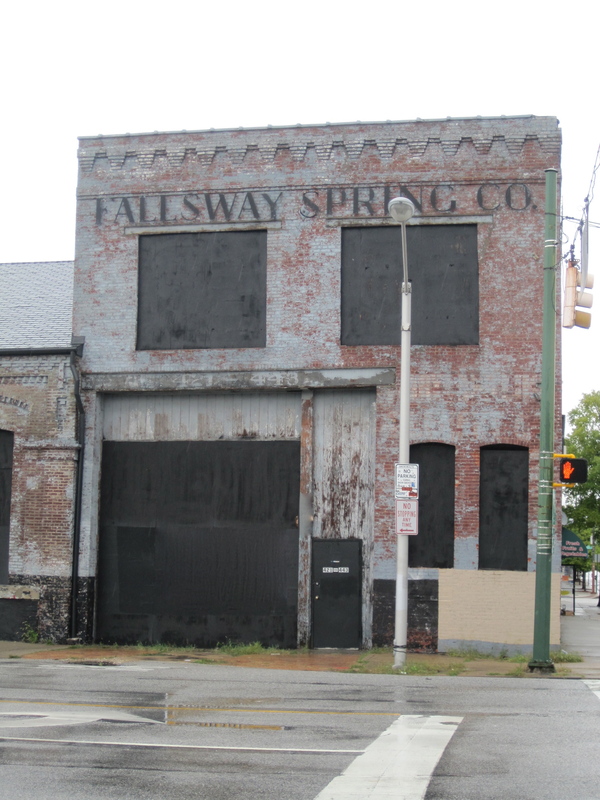 Baltimore is not one big crack den, as per the common mischaracterization. Sure, there are bad streets, dangerous corners, even sketchy bus routes. Once, on a city bus back from the mall with our American Eagle and Abercrombie bags, an older, rougher-looking Baltimore dweller warned my friends and I to “never take the number 8.” She didn’t elaborate, but her tone conveyed everything. I never took the number 8. Baltimore is a city that runs in zones. Good zones, bad zones, with very abrupt transitions. It seems that the gentrification is largely the expansion of some of the “good zones.” This weekend, I experienced “Harbor East.” Baltimore’s Inner Harbor was gradually saved from post-industrial dilapidation over the course of the latter 20th century. The laying of new cobblestone, erecting of romantic bridges and emergence of new restaurants has slowly crept further east along the waterfront so that what was still dingy in my college years is now fairly unrecognizable. It’s beautiful (and not at all scary to stroll through, even at night). And thankfully, in spite of Barnes and Noble, Whole Foods and yes, Hooters, it still feels like Baltimore–regal Federalist architecture, the rather ugly World Trade Center looming over the harbor where the dragon boats bob up and down, and unexpected landmasses, like Federal Hill, jutting into the harbor’s water at odd angles. In between the freshly filled cracks, you can still find the gems that make Baltimore one of America’s most underrated cities. And of course: the crabs. Crab cakes, crab soup, crab dip, crab on my Eggs Benedict at Marie Louise. My first crab-eating experience was one of the more memorable freshman week events: the Crab Feast. The native Marylanders approached with eager appetites and a sense of pride. “We’ll show you how it’s done–don’t worry” they said to the rest of us, who were overwhelmed by the spiny, uninviting and seemingly impenetrable crab shells, steamed to a screaming red. After much cracking, tearing, digging and pulling for a paltry amount of meat, I realized that just the discovery of Old Bay was well-worth the mess and loss of dignity. After all, getting messy over food is a great equalizer and fantastic way to build camaraderie among relative strangers. It certainly worked for my group of friends. So with that, I highly recommend you visit Baltimore if you never have, or if you haven’t been in a while–and thanks to my friends Erin and Kieran for getting married there so I could revisit this great city! Congrats Erin and Kieran! So romantic! 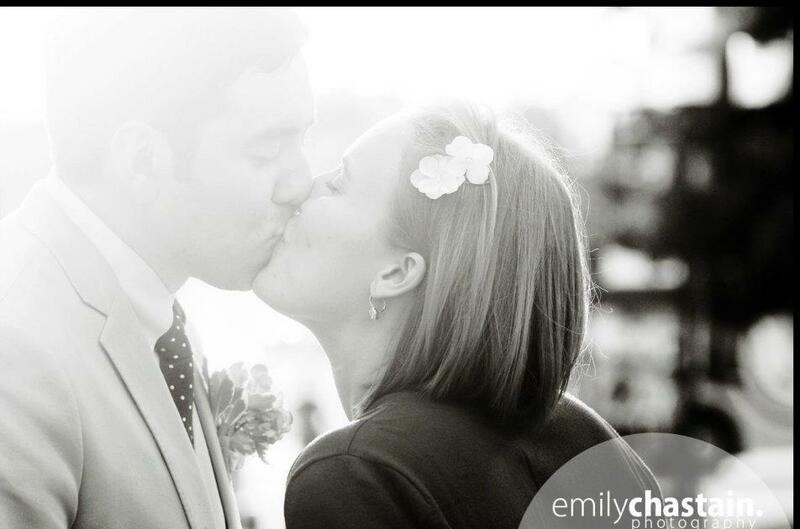 By the way, all of the incredible wedding photos are courtesy of Erin and Kieran’s photographer, Emily Chastain. Check out her site, especially if you have an upcoming event in the Annapolis/Baltimore/DC area! ← Why does all the sh!t hit the fan at the same time? Baltimore like every other city in the world has a few rough patches to avoid but I think as a tourist there is no reason you would be wandering into those areas anyway. Yes, it’s true–tourists tend not to see the seedier sides! 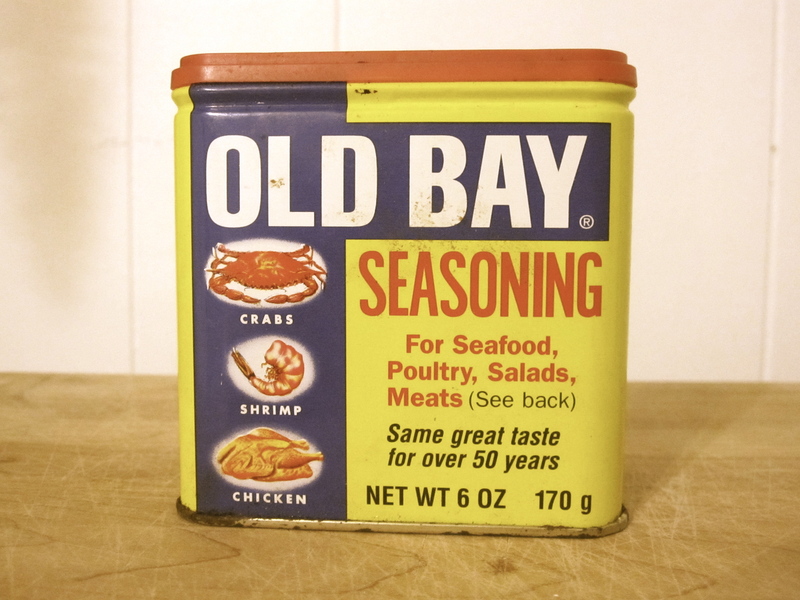 Gotta love the Old Bay! Your spice can looks just like mine…then it’s got to be the real thing. Such a lovely photostory filled with love which is what wedding trips are about. So glad your car got you to VT. What an adventure! Thank you for the film clip…love chic flicks…and that one was great. I had completely forgotten that scene so it was like watching it for the first time. Yes, my friend Erin and I loved that the restaurant looked like the one in the movie so I’ve been wanting to see that clip ever since the weekend! And the Old Bay can is definitely a good one! Also – we put old bay on our popcorn at the theater in harbor east… sooooo gooooood. I took the number 8 bus once… there was a woman vomiting into a CVS bag right up front i the handicap seating. 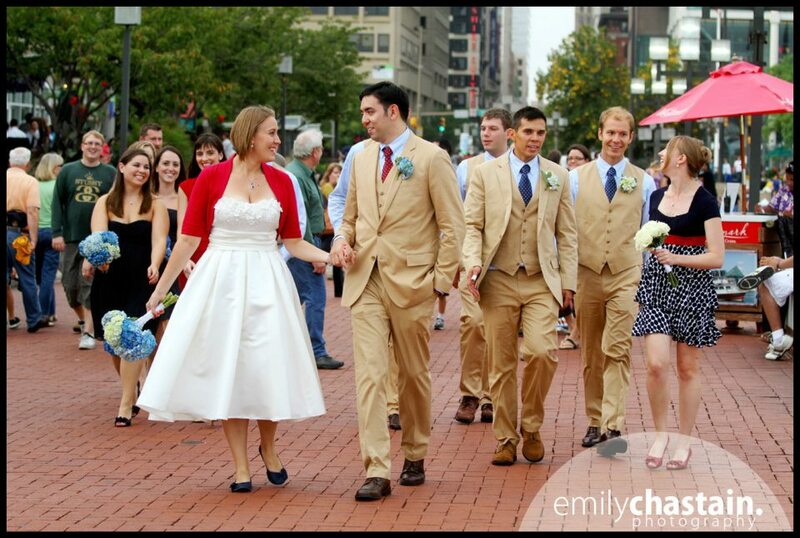 Also, thanks for posting about my wedding! YAY! 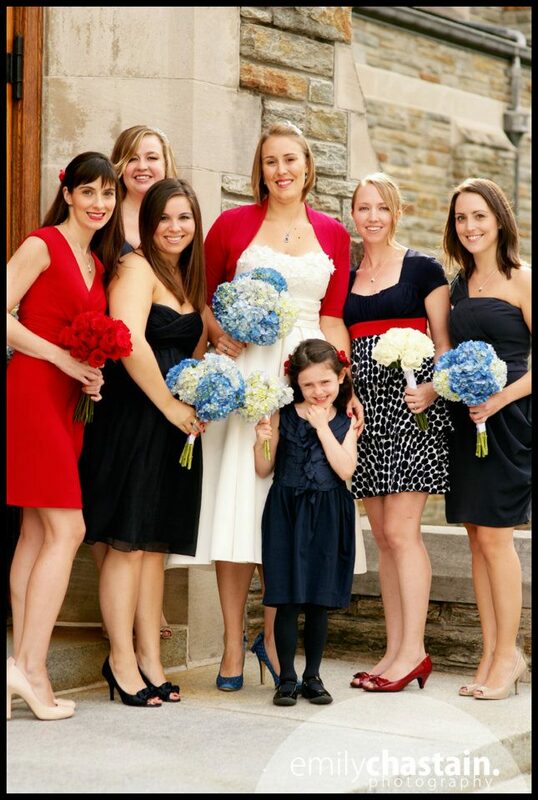 It was soooo fun and you were an awesome bridesmaid! Hahaha that sounds like a good time. Yikes. You’re welcome for the wedding shout-out! I had so much fun! It was an honor to be one of your patriotic ladies! And Old Bay popcorn… can you believe I’ve never done that? !